Jan. 3, 2013 3:00 p.m.
After wandering around Town Hall singing "All I Want For Christmas Is An A.S.P. ", Devon's Mayor Anita Fisher accepts the Christmas gift she was hoping for; an Area Structure Plan for a section of land on the east side of town. 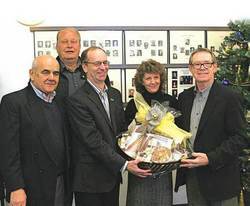 It was wrapped up and presented to her by (from right to left) developer Gregory Wilkes, Mayor Fisher, Leduc County Mayor John Whaley, land owner Robin Peterson and developer Harry Zuzak.